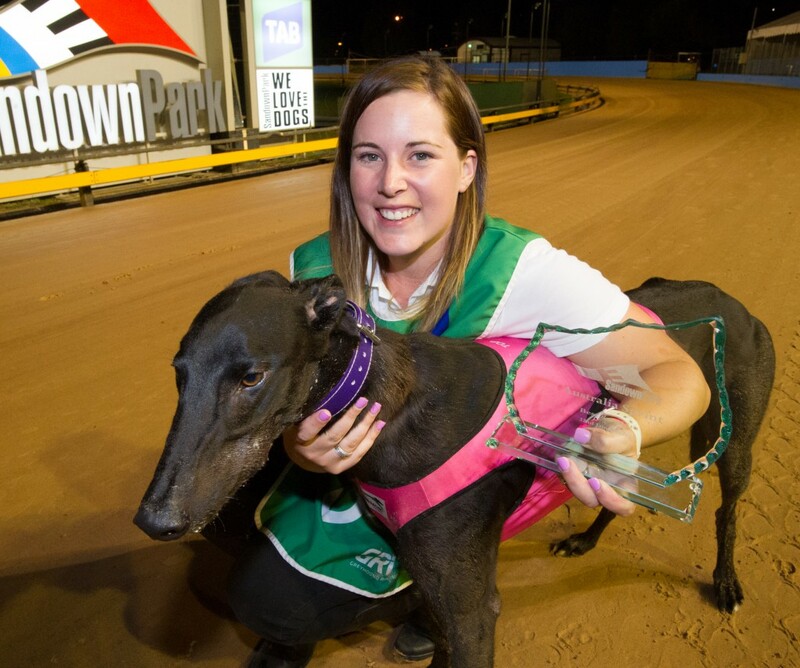 Popular young trainer Brooke Ennis landed four winners last night at Sandown Park, including both Listed feature events..
Lady Toy took out the night’s opening feature, the Listed Maidment Memorial (595m), with an impressive railing effort in 34.13. A renown slow beginner, Lady began relatively well to assume a rails position behind early leader Come On Fantasy. Despite being crowded for room through the catching pen, Lady Toy held her position and displayed an impressive turn of foot down the back straight, eventually railing under the early leader to claim a powerful four length victory. Lady Toy, or ‘Lucy’ as she’s known at home, only arrived in Ennis’s kennel over the weekend but hasn’t taken long to make an impression on her new trainer. “I’m very happy with her, she’s a lovely dog” said Ennis. The win was a welcome surprise, especially given nominating for the race was not the preferred option. “We actually nominated for a 715m race but there weren’t enough nominations for a race to go ahead. In the night’s second feature, My Bro Fabio reminded all why he is regarded as one of the most exciting greyhounds in the country with a stunning last-to-first victory in the Listed Australian Sprint. Despite a tardy getaway, My Bro Fabio enjoyed a clear run through the first turn before unleashing a devastating burst down the back straight to sweep around his high class rivals and storm to a 1½ length victory in a slick 29.27. The big striding son of former Meadows track record holder Turanza Bale recorded the fastest win at the track in 2014, and showed that he is close to recapturing that form following a lengthy break. “I thought he was OK last week,” said Ennis of My Bro Fabio’s first start in seven weeks. Kennelmate Dream It held on for second, giving Ennis the quinella. “That was exciting too, he’s like one of my kids. I was very excited – I was actually cheering for him before I realised Fabio was a bit close. It was a great run, I’m very happy with how he went. Earlier in the night, Cash Rules claimed race 2 while promising youngster Margins took out race 10 to complete a memorable night for Ennis. In 1933, following the death of Mr. A. Flint, Roy Maidment filled the vacancy of Secretary of the National Coursing Association. One of his greatest achievements was the part he played in forming the Australian New Zealand Greyhound Association in 1937 and the subsequent production of the Greyhound Stud Book. He was secretary of this association from inception until 1965. First run in 1972. Roy Maidment was secretary for the first Greyhound Racing Control Board and assisted the Board in laying the foundation for conduct of the sport.